CARFAX 1-Owner. King Ranch trim. 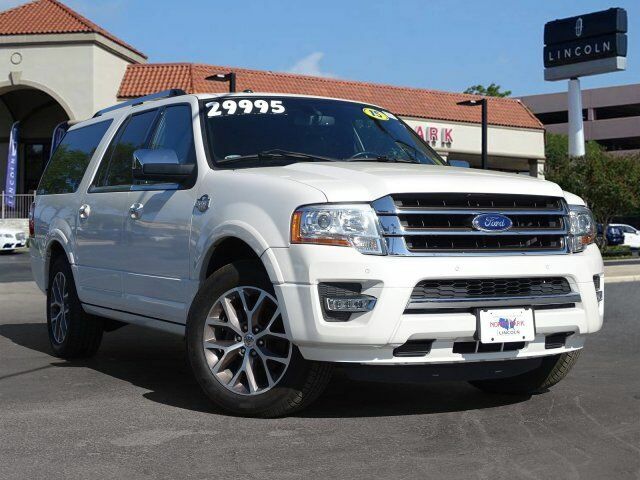 Sunroof, Navigation, Heated Leather Seats, 3rd Row Seat, Captains Chairs, Turbo Charged, Alloy Wheels, Trailer Hitch, EQUIPMENT GROUP 401A, 2ND ROW BUCKET SEATS, ENGINE: 3.5L V6 ECOBOOST, POWER MOONROOF. AND MORE! Leather Seats, Third Row Seat, Power Liftgate, Rear Air, Heated Driver Seat, Heated Rear Seat, Cooled Driver Seat, Back-Up Camera, Premium Sound System, iPod/MP3 Input, Bluetooth, Trailer Hitch, Aluminum Wheels, Remote Engine Start, Dual Zone A/C. Rear Seat Audio Controls, Privacy Glass, Keyless Entry, Remote Trunk Release, Steering Wheel Controls. POWER MOONROOF, 2ND ROW BUCKET SEATS, ENGINE: 3.5L V6 ECOBOOST (STD), EQUIPMENT GROUP 401A Voice-Activated Navigation System w/HD Radio, SiriusXM Satellite Radio Activation and programming subject to geographical location and availability, HD Radio, Power Deployable Running Boards. Ford King Ranch with White Platinum Metallic Tri-Coat exterior and Mesa w/Ebony interior features a V6 Cylinder Engine with 365 HP at 5000 RPM*. Edmunds.com`s review says For cargo of all kinds, it`s one of the roomiest vehicles on the road, too, with more than 130 cubic feet of cargo space available in the Expedition EL version when you fold down the second and third rows of seats..